This is the third blog in a week-long series to highlight the importance of disaster preparedness. Follow us this week as we take a look at how NOAA prepares for natural and human-made disasters, and how you can prepare for the 2018 hurricane season. Share your #DisasterPreparedness strategy by commenting on our blog, or replying to our Twitter and Facebook. 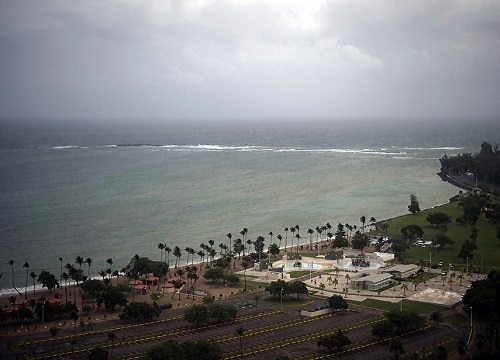 The outer band of Hurricane Irma approaches San Juan, Puerto Rico, on September 6, 2017. At this point, Irma was a category 5 hurricane. Image credit: U.S. Air Force photo by Staff Sgt. Douglas Ellis. For most of my life and all my NOAA career, I have lived and worked in the Gulf of Mexico. 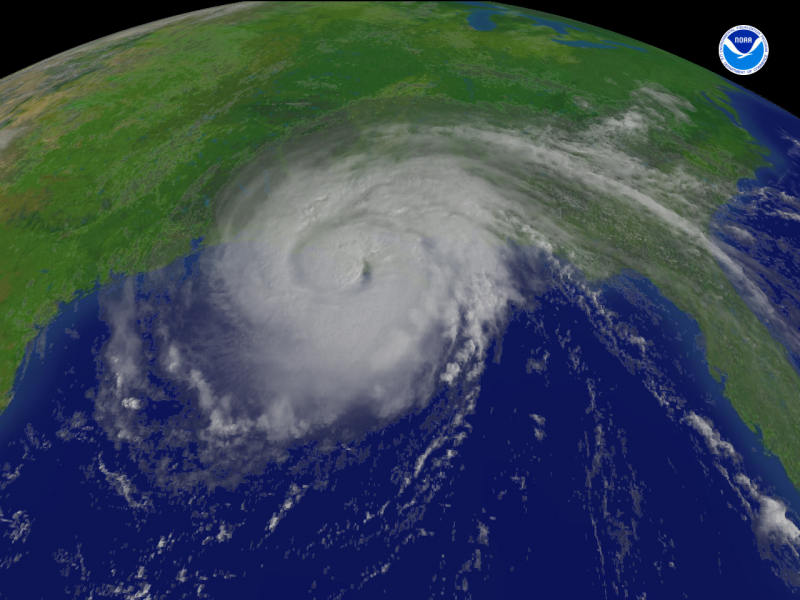 When Hurricane Katrina made landfall in 2005, I was working for NOAA in their New Orleans office. Katrina was far from the first or last disaster that I had lived through in my long career. Severe weather events are just part of nature, and for me, they’re part of my job as an emergency responder. As a young teenager, I remember a tornado that ripped a line of destruction very close to our house — only just missing us. It was frightening, and a few neighboring houses weren’t quite so lucky. In 1969, I traveled with my grandfather to see the devastation of Hurricane Camille, which hit along the Mississippi coast. At a very early age, I had developed a healthy respect for the damage that storms could do to people’s lives and property. My family and I are lucky to have never been an actual victim of a disaster, but that doesn’t mean we haven’t had to deal with property damage and secondary impacts. Luck may be part of our survivability, but planning ahead for what nature threatens is, by nature, just a part of our lives. It’s strange to say, but there have been some special times as well — times when disasters have made me appreciate what I have. Hurricane Gustav. Image credit: NOAA. I remember a time in 2008, after Hurricane Gustov, when our roof was severely damaged and we were without power for nearly six weeks. About a week after the storm passed, my wife and daughter went through the National Guard assistance line to get a big, blue FEMA tarp to help keep the rain out. All we needed was the tarp, but those young women and men gave us two tarps, a case of Meals Ready to Eat (MREs), a case of water, and a bag of ice. The ice was a real treat. Unless you’ve been in such a situation, you might not appreciate a bag of ice or having a family dinner illuminated only by candle light. It was hot and humid, there was no power, and we were eating a combination of our hurricane survival supplies and MREs, but on that night we had something cold to drink. Most importantly, we were sharing a family meal together, we were OK, and we were in good spirits. I still remember that meal as a special family time during what was, for many, a very real disaster. As an emergency responder, I’m expected to be prepared. First and foremost, I want to know that my family and my dog are safe — even if that means that they’ve had to evacuate so that I don’t have to worry about their safety. Though that hasn’t always been easy, as my wife works in a hospital emergency room. Having a plan is essential. It should focus on family safety, key records, important medicine and prescriptions — including a spare pair of glasses for my wife, who can’t drive without them — and keeping the cars fueled. My house and property are of far less importance, though they are well stocked with supplies such as food, water, and other essentials at the start of hurricane season. Property can be replaced, but our lives and the lives of those we care about cannot. No matter where you live, a natural disaster could be a part of your life. Natural disasters just happen — whether we want them to or not. They are not controlled by our calendars, and they don’t care about our wants or our needs. You might not know it, but natural hazard events are relatively common. A quick look at the NOAA National Weather Service’s daily briefing will generally indicate multiple events across the U.S. Of course, not all of these are devastating enough to be considered a disaster. 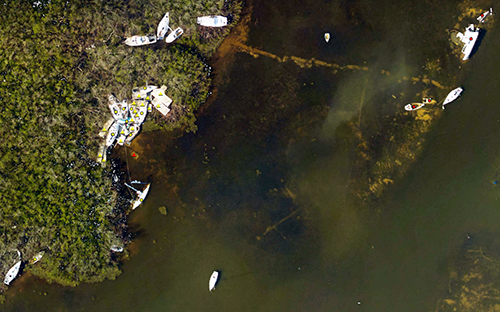 Aerial view of damaged and grounded vessels derived from NGS imagery. Image credit: NOAA. Most of us have never faced a true major disaster such as the 1700 Cascadia Earthquake and Tsunami that changed the Pacific Northwest and even impacted the island of Japan, the New Madrid earthquakes in the Mississippi Valley during the 19th Century (the largest series of earthquakes documented in the U.S. affecting an area of nearly 2 million square miles), the Tri-State Tornado in 1925 that killed 695 people in Missouri, Illinois, and Indiana, or the more recent Hurricane Maria in 2017 where a recent study estimated that storm-related deaths reached 4,300. For each of these major disasters, there are hundreds of lesser disasters with impacts spread across the U.S. There are those who think such events are not worth planning for — and if it does happen, they’ll just deal with it. As an emergency responder and preparedness planner, I would naturally believe such reasoning to be a failed contingency plan that would put an individual, their family, their pets, and their property at greater risk. Preparedness means planning for those real threats and hoping that they never happen. If they do, you have a greater chance of surviving physically and mentally if you are prepared in advance. Mentally planning for a disaster is very important to survival and maintaining a positive attitude rather than an overwhelming feeling that you are suddenly a victim. We prepare to be survivors just as the generations that lived before us. Most of us work, live, and play without too much worry about disasters — and for the most part, we’re safe from these threats. If we weren’t, we probably would live somewhere else. But where? The other day I was reading an article on the top 10 cities identified by an insurance company study as the safest cities in the U.S. The study was limited to hurricane and tornado threats. Unsurprisingly, many West Coast cities made the list, while none of the Gulf of Mexico cities did. While these cities may be safe from hurricanes and tornadoes, I couldn’t help but think, “but what about forest fires, flash floods, mudslides, earthquakes, tsunamis, volcanoes, massive ice storms, snow storms, and severe heat waves?” Being an emergency responder, I could have taken this entire blog to list possible natural hazards and past disasters. In truth, no place offers 100 percent safety guaranteed. Each city and region comes with its own unique threats. Do you have a personal or family emergency plan that includes a place to evacuate to and adequate food, water, medicine, and cash? During Hurricane Katrina, 1,833 people officially lost their life. More than a million people in the northern Gulf of Mexico had their lives significantly changed as a result of a storm that left $108 billion dollars in property damage. Failure to recognize a threat, failure to have effective community, personal, and family emergency plans and supplies, and a failure to act often contribute to the very real human impact of a disaster. I personally didn’t know anyone who died during Katrina, but I knew people who lost everything and were rescued when they failed to evacuate. Be part of the solution and not part of the problem — make being ready for an emergency as natural as such disasters. This is a post by OR&R's Charlie Henry, director of NOAA's Gulf of Mexico Disaster Response Center. To stay up-to-date on the latest storm warnings and advisories, visit the NWS Storm Prediction Center. To hear Charlie Henry talk about response efforts during Hurricane Katrina, listen to Episode 62 of the Diving Deeper podcast. For more information and resources to help you put together your family emergency plan, visit the National Weather Service. 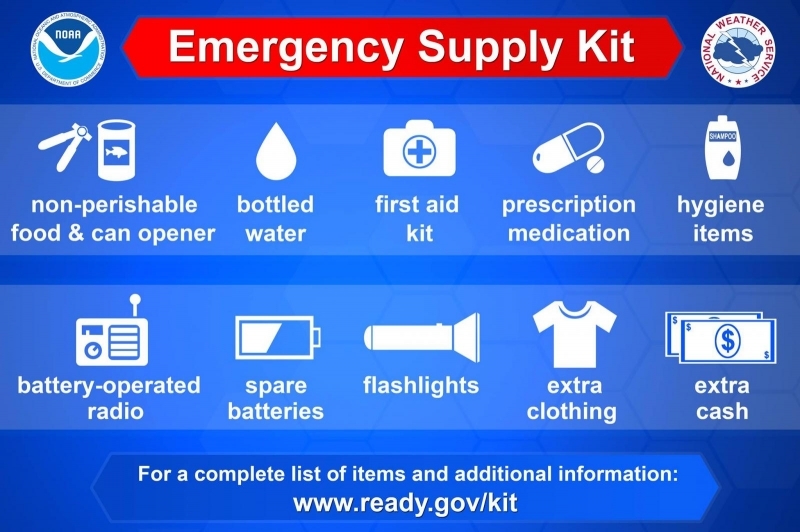 Download FEMA’s free Emergency Supply List. For disaster-specific preparedness information, visit Ready.gov. needed was the tarp, but those young women and men gave us two tarps, a case of Meals Ready to Eat (MREs), a case of water, and a bag of ice. The ice was a real treat.